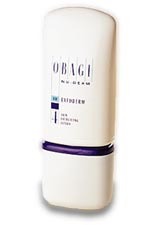 Obagi Nu-Derm Exfoderm® skin lotion comes in two varieties, for normal/oily skin (Exfoderm Forte) and for normal/dry skin. Designed to create a healthier, more youthful complexion, Nu-Derm Exfoderm even helps minimize pores and prevent acne breakouts. Nu-Derm Exfoderm's formulas use alpha hydroxy acids and natural plant acids to gently exfoliate skin and encourage new cell growth, for a brighter, smoother, more even skin tone. Primary Benefit: Creates smoother, healthier skin by exfoliating dead skin cells and encouraging new cell growth. Also prevents breakouts by keeping pores from clogging. Primary Ingredients: Alpha hydroxy acids (Forte), phytic acid, glycerin, magnesium, potassium, saponins etc. Skin Types: Nu-Derm Exfoderm comes in two product strengths to treat most skin types. Directions: Apply Exfoderm lotion daily to clean facial skin. Allow lotion to fully absorb before using other products. Recommended for A.M. use.